The Coloma Band Program includes the 5th Grade Beginning Band, 6th Grade Band, 7/8th Grade Band, High School Marching & Concert Bands, and the High School Jazz Band. The Band Program at Coloma has grown in size and quality throughout the years. In 2004, the HS band had 42 students, and now we have 89 students in 2018-19. You are welcome and encouraged to come to our concerts (see the Coloma Band Schedule). We hope you enjoy the sounds of the Coloma Bands at our concerts, parades, football games, basketball games, and other performances throughout the Coloma area. Find the "Coloma Band" group on Facebook (private group). Cheryl Thomas has been the Director of Bands since the fall of 2004. Mrs. Thomas is a graduate of Western Michigan University (Bachelor of Music Education), Southern Oregon University (Master of Music-Conducting), and she continues to take classes during the summer at the VanderCook College of Music in Chicago. While at WMU, she was as one of the drum majors of the Bronco Marching Band. She also performed in the Symphonic Band, Concert Band, Jazz Lab, Trombone Choir, and a Brass Quintet. During the summer Mrs. Thomas performs in the Lake Effect Jazz Big Band on 2nd/solo trombone (www.lakeeffectjazz.org). She has also participated in the SMC Brass Band. In MSBOA District 6, she served as the Vice President of Band & Orchestra for 5 years, and she served as the Jazz Vice President for several years also hosting Jazz Festival at Coloma HS. The band and orchestra directors in MSBOA District 6 voted Mrs. Thomas the band Teacher of the Year for 2012-13. She now serves as the Vice President of Solo & Ensemble (HS). Mrs. Thomas has served as a clinician at area schools in Southwest Michigan and she was a guest conductor at Hastings HS for Homecoming (alumni). In 2013, Mrs. Thomas was recognized as an outstanding educator by her peers and nominated become a member of ASBDA (American School Band Directors Association). Mrs. Thomas and her husband, Brandon, have two daughters, Amelia & Madilyn, two puppies (Lulu-a mixed breed dog that we rescued, & Coda-a miniature schnauzer), and a tank full of fish. She also enjoys gardening, camping, looking for Petoskey stones at the beach, and being a co-leader of a Girl Scout Troop (Brownies/Juniors). Christopher Keech as been the Band Assistant since the fall of 2010. 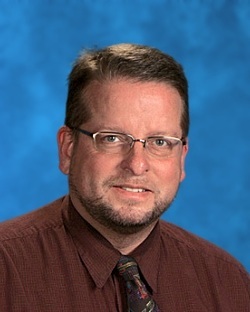 Mr. Keech holds a Bachelor of Science degree from Western Michigan University, where he majored in Music (with an emphasis in Jazz Studies), and minored in Journalism. As a professional musician for many years, he has performed in 49 states (he's still looking for a Hawaii gig!) and 19 countries. He has performed with artists such as Shirley Jones, Ben Vereen, The Captain and Tennille, Michael Bolton, Frankie Valli and the Four Seasons, and The Temptations. Chris also works as a saxophone instructor at Lake Michigan College, Andrews University and Southwestern Michigan College. He has previously taught music in the Benton Harbor, St. Joseph, Hartford, Niles, and Buchanan school districts, before coming to Coloma. Chris still regularly performs with the Lake Effect Jazz Big Band, and the St. Joseph Municipal Band. The 5th Grade Beginning Band has two performances throughout the school year (Winter Concert & Spring Concert). This band meets in the music/band room at Coloma Intermediate during the last hour of the school day. Flutes, Clarinets, Alto Saxes, & French Horns have band on Monday, Wednesday, and Friday. Trumpets, Trombones, Baritones, & Percussion have band on Tuesday, Thursday, and Friday. Percussion auditions are held in January. The 5th Grade Band uses Essential Elements 2000 Book 1. Prerequisite: music aptitude test, instrument fitting, and/or approval from the band director. Length-2 semesters. Band is a year long class. The 6th Grade Band has two performances throughout the school year (Winter Concert & Spring Concert). This band meets 1st hour at the High School Band Room. The 6th Grade Band uses Essential Elements 2000 Book 2. Prerequisite: 5th grade band. Length-2 semesters. ​ Band is a year long class. The 7/8th Grade Band has five performances throughout the school year (Combined Performance at Half-time, Winter Concert, Pre-Festival Concert, Band Festival, and Spring Concert). This band meets 3rd hour at the High School Band Room. These students have the opportunity to audition to be selected for oboe, bassoon, bass clarinet, tenor saxophone, baritone, and tuba. The 7/8th Grade Band uses Essential Elements 2000 Book 3. Prerequisite: 6th grade band and 7th grade band. ​ Band is a year long class. The Coloma Comet Marching Band has several performances throughout the year. During the fall, the Comet Marching Band performs at all home football games, two marching invitationals, and MSBOA District VI Marching Band Festival. This band also performs at five parades throughout the year (Glad-Peach Youth, Glad-Peach, Homecoming, and St. Patrick's), which are all in Coloma; the Blossomtime Parade in St. Joseph/Benton Harbor. The Comet Marching Band is proud to represent the Community of Coloma. The band proudly wears marching uniforms purchased by the Band Boosters & Board of Education (first performance with new uniforms was the Coloma St. Patrick's Parade in 2010). Prerequisite: 8th grade band, previous 9-11th grade band. Length-2 semesters. ​ Band is a year long class. Fall 2017, the Coloma High School Comet Marching Band earned a first division rating at the District VI Marching Band Festival for the 13th consecutive year, and they also placed 1st in Class C at the Lakeshore Marching Band Invitational. In 2016, they placed 1st at the Grand Haven Marching Invitational where they also earned awards for Best Music, Best Marching, and Best Color Guard in Class C Competition. We placed 3rd in Class C at the Hastings Marching Band Invitational in 2016. Congratulations to the 98 member band on an outstanding marching band season! The Coloma High School Concert Band has five performances throughout the year (Winter Concert, Pre-Festival Concert, Band Festival, Spring Concert, and Graduation). This ensemble includes all students from the Comet Marching Band and they begin rehearsing when marching season is over. For pep band, the band is split into two bands-Green & Gold, and they perform at the Friday night home basketball games after Winter Break. Prerequisite: 8th grade band, previous 9-11th grade band. Length-2 semesters. Band is a year long class. The Coloma High School Band has traveled to St. Louis (2004), New York City (2008), and Disney World (April 2012 & February 2016). We thank you for supporting our students by purchasing from our fundraisers (Fall Brochure, Poinsettias, Zap-A-Snack, Subway Card, Pop Can Drives, Car Washes). The Coloma High School Jazz Band is an extracurricular ensemble that begins rehearsing one evening/morning a week beginning in January. Acceptance into this ensemble is by audition only. The CHS Jazz performs at the Spaghetti Dinner/Port-a-Pit Fundraiser and Jazz Festivals at South Haven and/or Hastings. We have performed at the Berrien Historical Museum and the Point O'Woods Golf Club. Instruments in the jazz band include: alto sax, tenor sax, bari sax, trumpet, trombone, bass, piano, guitar, drums, vibes, & auxillary percussion. Length-January-April. Prerequisite: audition only. CHS Jazz rehearses from January-April on Thursday nights.